Spurred on by a request from a dear friend who now calls Boston home, I am finally sharing my tasty food tour of Boston’s North End – the bustling quaint Italian mecca of the city. 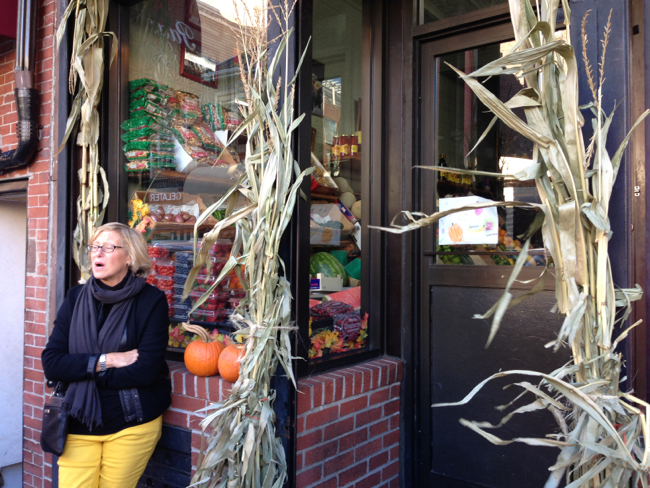 She wrote to me asking what food shops to visit this weekend while showing a friend around the charming North End. I could have taken the easy way out and just emailed her the names of the shops we visited, but after all the city endured last week, I thought more effort was warranted, even mandatory. 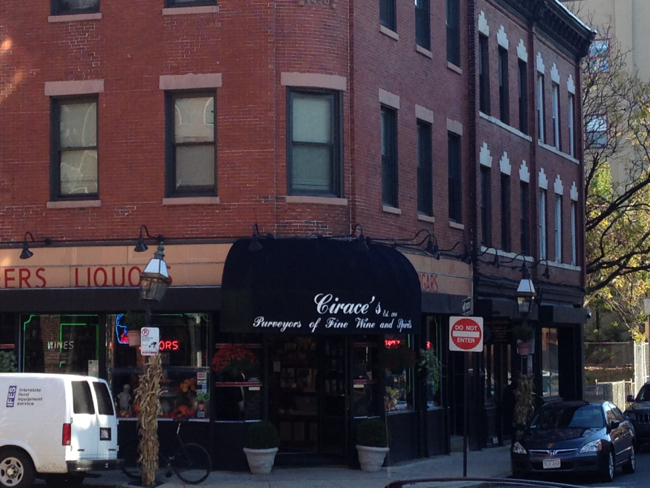 Last November, I travelled with a close friend who is a food fanatic of similar insanity to me, who procured the tickets for a walking food tour of Boston’s North End. BEFORE I BROKE MY FOOT! Yes, conveniently, during the first week of November, I broke a small bone in my right foot. No cast, just a boot and strict instructions not to overdo it. Ummm – would walking around for three hours on uneven cobblestone streets and crumbling sidewalks be overdoing it? Without mentioning a word of this to @dormantchef, who most certainly would have disapproved, I told Sharon we were not changing our plans. 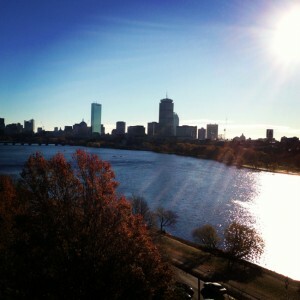 As long as the weather was dry, why waste a perfectly lovely morning in Boston? 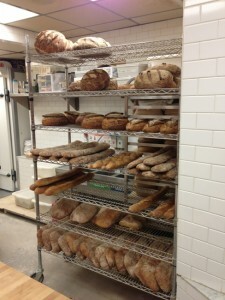 And the rest is delectable food history that I will share with you via my iPhone photos below. With a broken foot, I travelled light – leaving a free hand to catch myself if necessary. So one-handed iPhone shots are my photo-journalistic medium for this post. 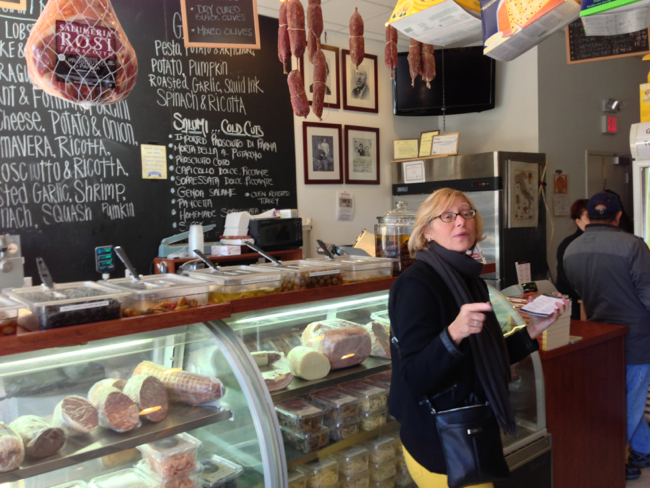 The tour was led by Kris Piatt, one of many talented tour guides employed by Boston Food Tours. She was personable, knowledgeable, and just a delight to spend three hours with while we ate and walked our way around the North End. 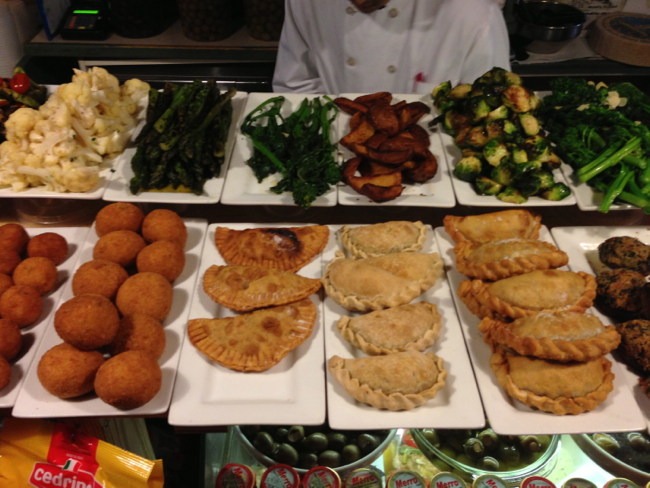 I would, without hesitation, recommend her and Boston Food Tours if you have a chance to visit the city and learn about its gastronomic marvels. Now let’s amble through the tour in the order we walked that day. We started with a bit of history of the North End, which is only one square mile of land located very close to the waterfront. 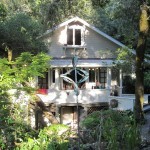 The area’s rich history includes Irish, Jewish, and Italian immigrants. 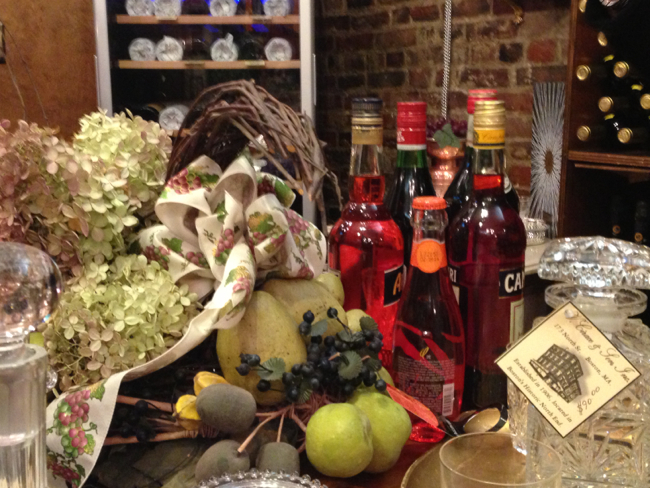 Read more about the North End’s history here. 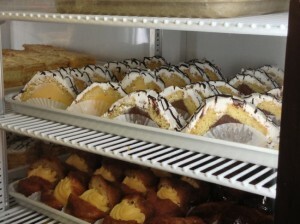 From there, we walked a short block to Maria’s Pastry Shop, an unadorned small store with busy bakers briskly preparing gorgeous treats that line the walls of the shop. 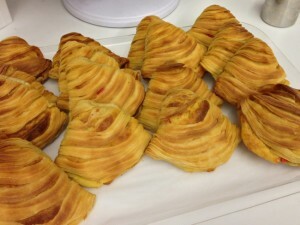 One of their most well-known pastries is the Sflogiatelle, a clam shell flaky pastry filled with cheese and citrus fruit. The Lobster Tail is a close cousin filled with vanilla mouse cream. We were each given a small plate with tastes of several of their best-known selections including their well-loved marzipan. 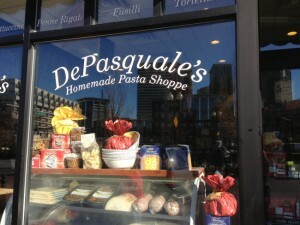 After whetting our appetites with pastries, we stuck with the p-words and moved on to DePasquale’s Pasta Shop. 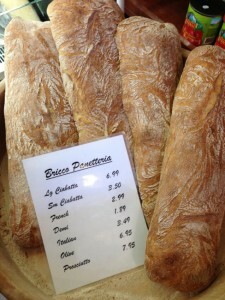 There we learned about the proper way to cook pasta, tasted olive oils, balsamic vinegars, and discovered the fabulous bread of the Bricco Panetteria, also in the North End. 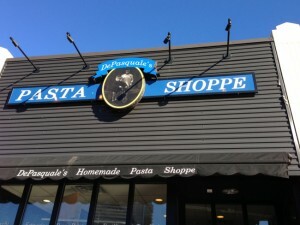 DePasquale’s is stocked with almost anything you might need to make an authentic Italian dinner. Though it’s a small shop, I could spend a long while in there browsing each unique house-made and imported food product they sell. From there, we I hobbled over to Polcari’s Coffee – an adorable old-fashioned grocery that stocks bulk herbs, spices, and all sorts of interesting ingredients including chestnut flour, Nutella imported from Italy (there is a difference and I wrote it about here), and over 50 different extracts for baking! While inside, Kris taught us about the two different kinds of pine nuts and cinnamon, details I was not familiar with before that day. 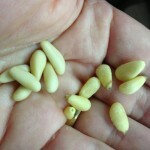 Pine nuts from Italy (on the left) are the ones pictured without the little dark spot at the end. The others are likely from China. The ones from China are cheaper but are known to cause many people to have a horrible after taste that lasts for DAYS on end. Who knew? 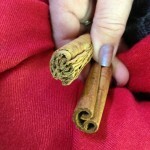 And the cinnamon – the one with layers of bark showing is true cinnamon or Ceylon cinnamon. The other is Cassia which is sometimes referred to as Chinese cinnamon or Saigon cinnamon. Both types are in the same genus and family of plants, but the health benefits associated with cinnamon are found in Ceylon cinnamon, not Cassia. When you buy cinnamon powder, you often cannot tell the source – Ceylon or Cassia. But the only “true” cinnamon, is the Ceylon variety. And finally I learned that Nutella made in Italy has less added fat and sugar so I bought a jar to take home for a taste test – which you can read about here. After squeezing into that delightful little store, we moved on to an even smaller market that sells produce called Alba’s. We could only go inside in shifts, it’s so small, but it is known widely for its fresh fruit and vegetables, which as in Paris, you do not touch yourself. You point at what you want, and they select and bag it for you. Also, there is no sign and no telephone, just the way the store was when it opened. 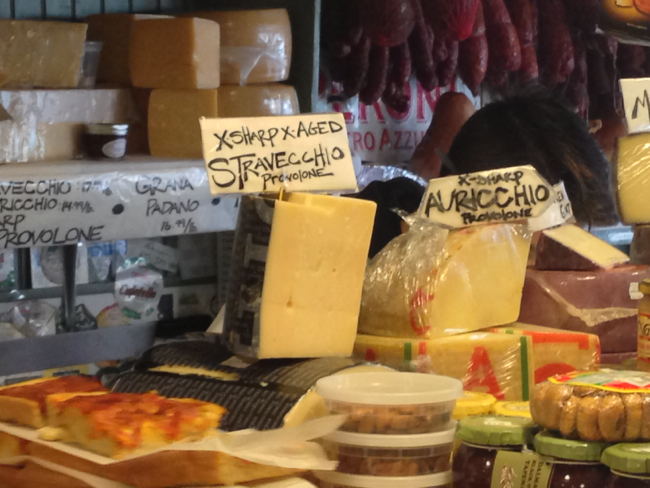 From there, we headed over to Monica’s Mercato, which is filled with appetizing deli items to gather for an antipasto plate, cheese plate, or various pantry staples needed for traditional Italian cooking. How about canned cherry tomatoes? 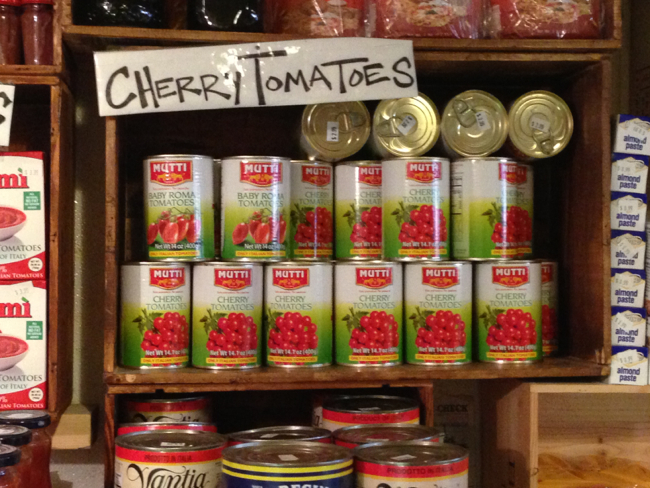 I shop in a lot of grocery stores from large to small and specialized but have never seen cherry tomatoes in a can. Wow. 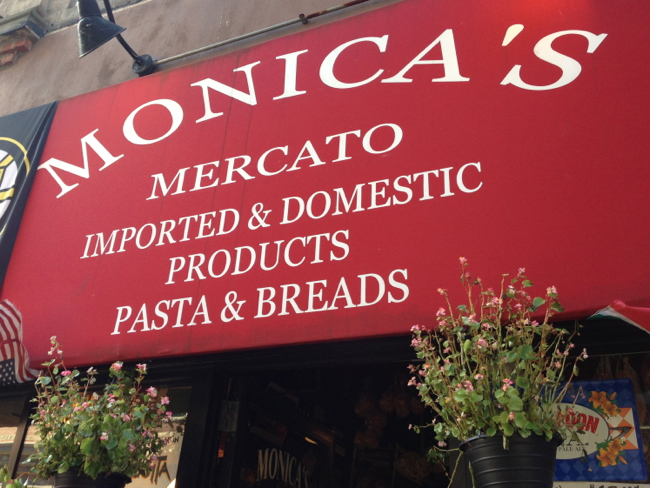 Along with their Mercato location, Monica’s has two restaurants – a Trattoria and a Wine Bar. I wouldn’t hesitate to visit either one after tasting their tempting treats at Monica’s Mercato. Hobbling at this point from the weight of my full stomach and my broken foot, we headed over for our last stop at a wine and spirits store called V. Cirace’s. Luckily, they had a chair for me. There, we learned about the traditional drinks served with an Italian meal starting with a light aperitif such as Campari with a splash of soda and lime, moving on to wine of which there are over 1000 varietals from Italy and finally an after-the-meal digestivo such as grappa or a liqueur such as limoncello, made in the southern region of Italy where lemons grow in abundance. 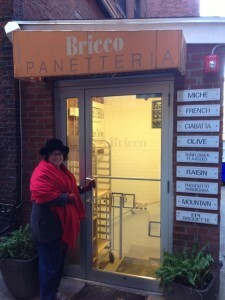 In case hunger struck us before dinner, we sought out the Bricco Panetteria storefront (the bread we tasted in DePasquale’s), tucked down a narrow alleyway and ventured downstairs to its counter to purchase a loaf of bread for snacking on later in the day. 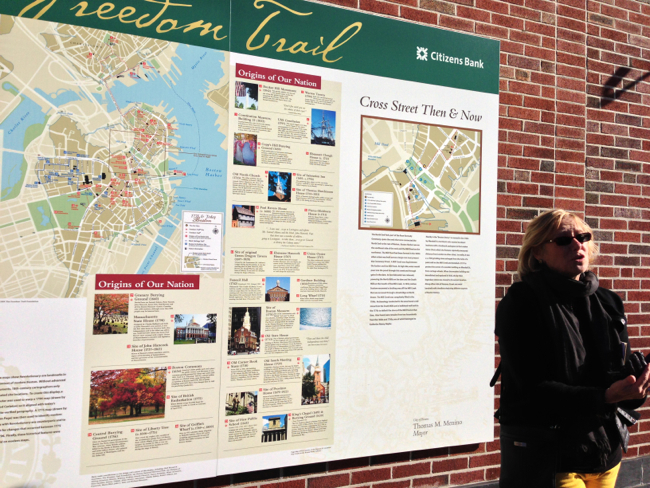 Every labored step was worth it for the rich taste of Boston history and food lore that Kris and the North End eagerly and eloquently shared with us that day. Have you visited Boston? If yes, what is your favorite food from the city? I’ve just found your blog and oh, what a nice tour of the North End! 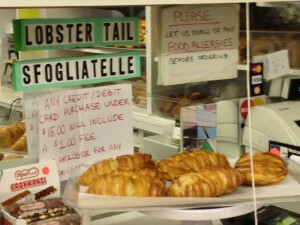 Boston is my all-time fave American city, so finding a tribute to its foodie spots is great fun! Thank you, from this Yankee foodie! Hi Susan – glad you found my blog! What part of the east are you from? 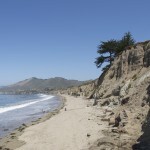 I grew up in Western Massachusetts in the heart of the Berkshires But I’ve been in California now for a very long time. I am really enjoying getting to know Boston from an adult perspective. What a great city. It was great to connect with you on Twitter and talk Boston and Spain. Look forward to connecting more virtually and hopefully someday in person! Thanks for coming by! I think folks here in CA would be amazed at how small an area it is. Lovely post. I agree Liz – we are so used to suburban sprawl. But I don’t think I could find 1/2 of what is in that small area in 100 times the space where I live. What a treat it was! I don’t remember much about the North End having lived in Boston for 9 months. However I do remember not eating in one good restaurant while there. Perhaps that was the fault of the people we went out with. 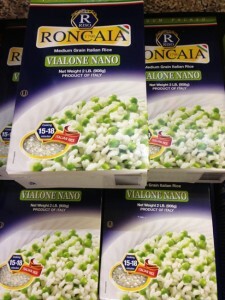 I am glad to see they now have some great little food shops. These shops, for the most part, have been there a very long time. You, indeed, did not find the good stuff while you were there 🙁 It is a city just bursting with great food all over. Oh, I am homesick now! What a marvelous tour of the North End. 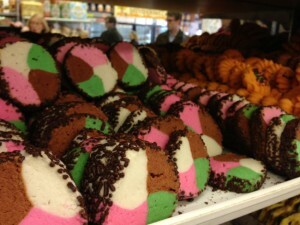 I’ve spent lots of time in Polcari’s – my folks used to live quite close and we’d walk over. In the summer, Polcari’s keeps a barrel of lemon Italian ice by the door, so you can eat heavenly scoops of it on a hot evening. Thank you for all you shared here – I’m saving this for my next time in Boston. 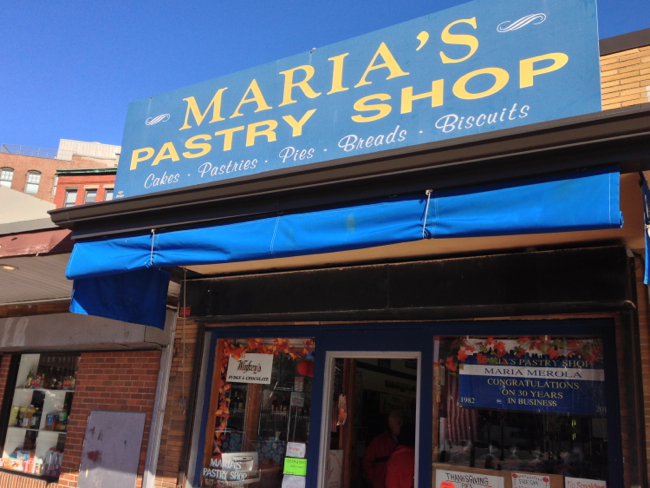 A visit is never complete without a stop in the North End. And we usually make a point of going to JP Licks for ice cream on Newbury St. You did a terrific job of walking and taking photos with your broken foot. I’m impressed! I’d love to visit Boston with you Hannah. I bet you know so many great secrets like the Italian ice in the summer. 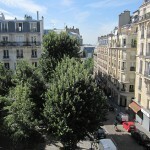 Just loved that one square mile – could have spent my whole day there for sure. Thanks for sharing your memories! Yum! I’m hungry now. 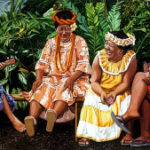 Beautiful pictures even if you were impaired!